The first weekend for the MF iConfessional was a success. Admittedly, I was unsure of the outcome or if visitors would even participate in the experiment. But to my surprise, there are 14 uploaded videos -- a nice mix of reactions, thoughts, comments. Pretty good considering the confessional was "Out of Order" for most of Sunday. Since the MF is closed on Mondays, we troubleshot some technical (audio mismatches) and operational (booth aesthetics, wandering forest background) issues this morning. These issues should be resolved moving forward. 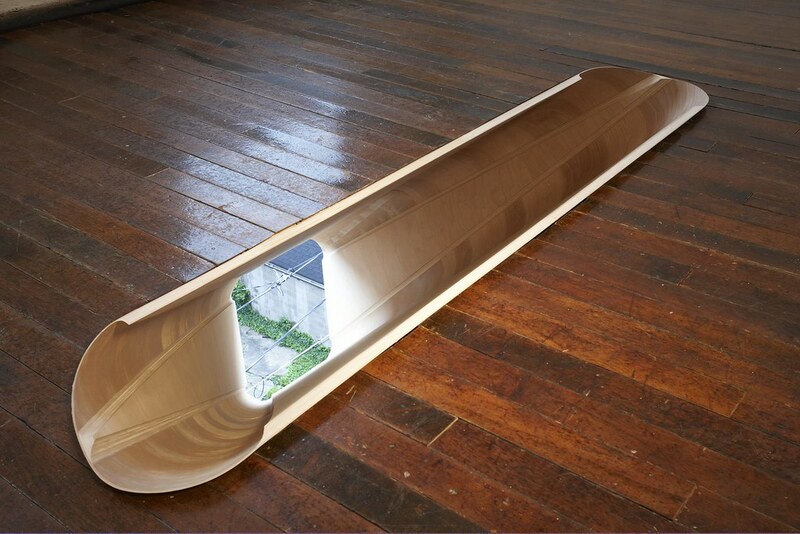 THIS JUST IN: Sarah Oppenheimer's 610-3356 makes Tyler Green's top-ten list for 2008. Dark Side of Light was originally conceived as an analog version (sans video and technology) of a media-saturated Web site, such as Paper Rad's own internet home, but the conceptual frame of the piece changed as Jessica and Jacob Ciocci (sister and brother team) collaborated on-site at the Mattress Factory. Often, passersby would be selling second-hand wares (i.e. televisions & radios) and objects could be found nearby, abandoned on the street. 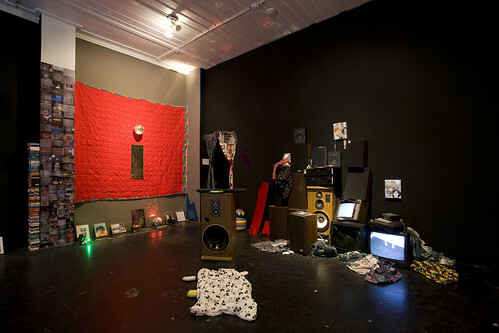 A selection of these purchased and found items is incorporated into the installation. As Jessica recounts: “first day of arriving/found speaker on street and mickey mouse sleeping bag on ground which is [now] laying prone to speaker in the [installation] space/both [found] within one block of Mattress Factory.” Likewise, on the day before the opening, “a man walked by with a shopping cart trying to sell a TV” — there were no takers, except Jessica. She was already working with used televisions — stacking them, along with speakers into a mini Babylonian pile of partial working screens and inconsistent amplification. Jacob followed suit, but gleaned most of his objects from his own thrift store collection, i. e. old VHS tapes, kept in their boxes and simply stacked in a corner, a slightly ripped, old Magic Eye poster, a tin of loose pocket change. The text above was written by guest-curator Melissa Ragona. PREDRIVE: After Technology runs through April 5, 2009. David Ellis, shown creating the imagery for one of his trademark "animated motion paintings," is exhibiting in the Mattress Factory's "Inner and Outer Space" and will speak at 7 tonight at the North Side museum. Individual installations by nine international artists who probe "Inner and Outer Space" add up to one of the Mattress Factory's best exhibitions to date. 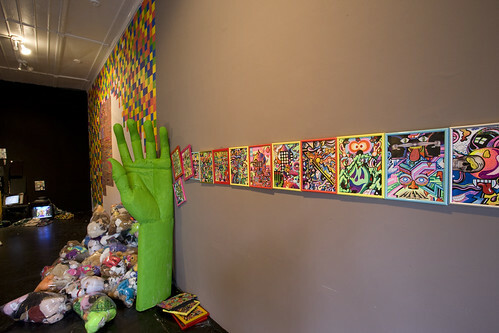 The North Side venue is no stranger to artists who transgress routine expectations, aesthetic and metaphysical, to create encompassing experiences that position visitors to imagine the world anew. For this show, says guest curator Dara Meyers-Kingsley, "the 'inner and outer space theme' -- the conceptual underpinning for the exhibition -- not only relates to the form and content of the work but also an approach to artistic practice." The works spill through floors, out windows, into the parking area, onto a Jumbotron and arrive via e-mail. One was completed with the help of local artisans. 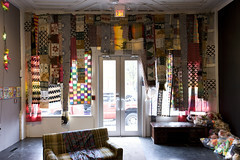 Case in point is exhibiting artist David Ellis, who will give an Artist Talk at 7 tonight at the museum ($5, members free). His trademark "animated motion paintings" are captivating, both for their vibrant graphic imagery and their intriguing process. To create "OKAY," included in the exhibition, he set up a Quonset-hut-like structure in the museum lobby within which he painted from morning until night during his 15-day residency. 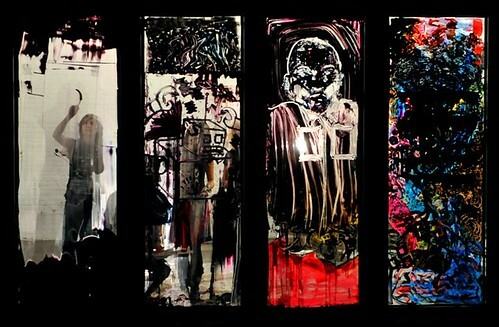 Ellis paints over previous works, layering imagery that is recorded every few seconds by a camera suspended overhead. He edits these digital images into mesmerizing projected works that change with flipbook speed. Below are some images from last night's educational workshop, which paired students from CAPA High School with Inner and Outer Space artist David Ellis. David continues to work with the students through Wednesday evening and gives a public artist talk on Thursday. Photos by Justin Merriman of the Pittsburgh Tribune-Review. Tweet Your Questions for Saturday's Curator Talk. The Curator Talk coming up this Saturday promises to be an engaging discussion about curatorial practice and related thematic threads running through both Inner and Outer Space and the Carnegie International: Life on Mars. It's really great that Douglas Fogle and Heather Pesanti will be able to join Dara Meyers-Kingsley for this special event as we approach the close of both shows. 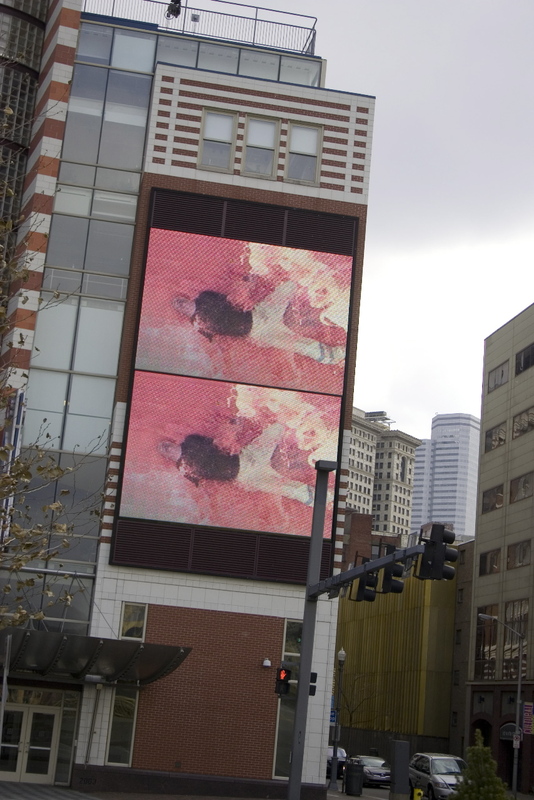 It has been a great year for art here in Pittsburgh, and this event is a great way to cap it off. A Q&A/discussion session will follow the talk. For those of you who are unable to attend, or live outside a commutable radius, we are accepting questions in advance via Twitter. I'll do my best to make sure all questions are answered and then post the transcript (organized by Twitter username) here on the MF weblog early next week. If you'd like to ask Douglas, Dara or Heather a question, send us a message on Twitter (@MattressFactory) before 2.00PM this Saturday. If Twitter's not your thing, you can always send me an email and I'll make sure your question is included with those received on Twitter. Give the Gift of Green this Holiday Season. Happy Holidays! 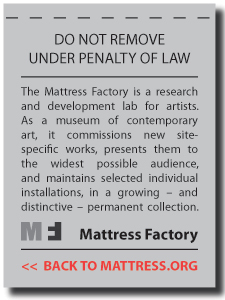 The Mattress Factory is known around the world for pushing artistic boundaries, but did you know that we like to challenge the status quo on the administrative side of things, too? This past April, the museum became the first in the United States to offer a Green, 100% paperless membership level. At $50 per year, Green members receive all MF correspondence electronically (eliminating 20+ exhibition announcements, newsletters, event invitations, etc. ), but keep all other membership perks (FREE admission, discounts, etc.). The MF Green membership is positive all-around. A higher percentage of membership dollars goes directly to support the art (that's why we're here, right?) and, in turn, the museum produces less paper materials, easing the demand on our environment. 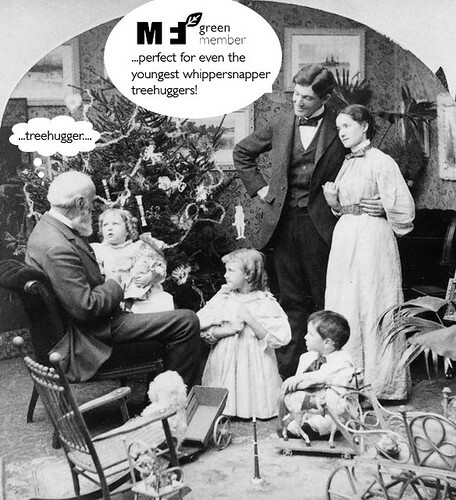 From now until December 31st, I've discounted MF Green memberships to $35 (SAVE $15!). Now is the perfect time to become, or renew as, a Green member. And don't forget: You can give the gift of Green this Holiday season. It’s better for the environment and your wallet. Visit www.mattress.com/green for more information! 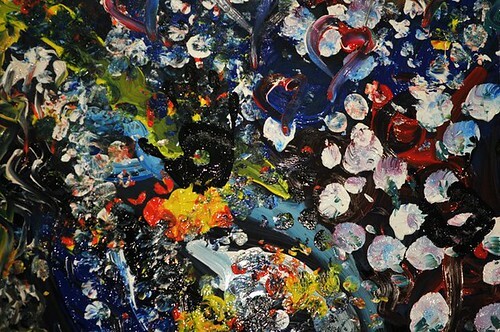 One of my favorite pieces in the Inner and Outer Space show is David Ellis' motion painting, OKAY. I think it really captures the essence of what an artist residency at the Mattress Factory is all about. During the month or so David spent here in Pittsburgh, he assimilated not only into the Mattress Factory community, but the larger Pittsburgh community as well. For 15 days straight, David created work inside a hanger-like structure he transported from his Brooklyn studio to the museum lobby. More on that process HERE, HERE and finally HERE. David enjoyed listening to a varied playlist of music while he worked. As museum visitors passed by his workspace, many were drawn toward the bright lights and pulsing tunes. Rather than keeping his MF studio off-limits, David welcomed visitors into his area and invited questions, comments and casual conversation from curious passersby. And when you view the final piece on the museum's first-floor gallery, you can see the many MF staffers, volunteers and helpers that assisted him with the project in quick, still-frame images that flash by in an instant. The connection between artist and viewer is often times a line drawn in the sand, over which neither dares step. But during his time here at the museum, David erased that line. In my mind, that embodies art-making at the Mattress Factory. David will be coming back to Pittsburgh the week of December 15 to facilitate a series of workshops with students from Pittsburgh CAPA High School. We will be documenting the workshops with the intent to publish some of the content online. 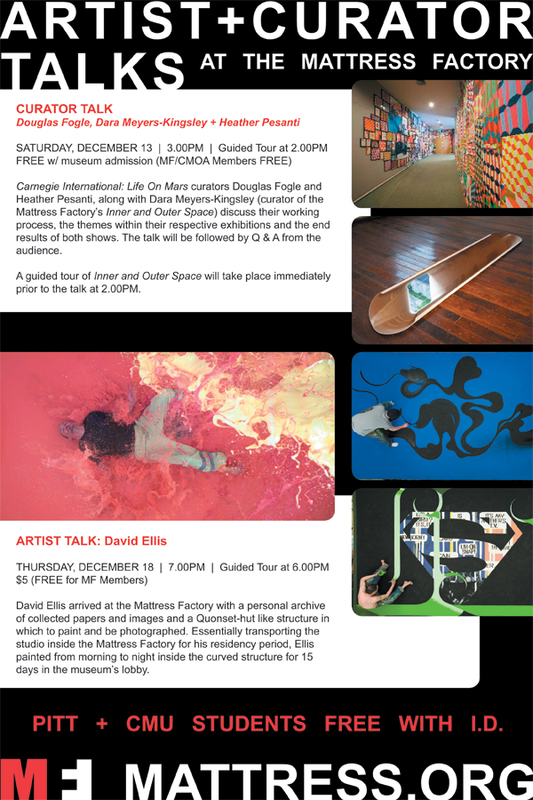 David's week in the STEEL city will culminate with an artist talk at the Mattress Factory on Thursday, December 18 at 7.00PM. More information about the public event HERE. Takeshi Murata, Homestead Grays, 2008, Video and hand-drawn animation. 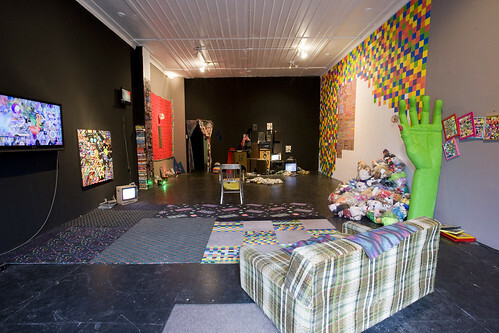 PREDRIVE: After Technology (currently on exhibition at The Mattress Factory, Pittsburgh, PA, November 14 - April 5, 2009) features new works by six international artists including Takeshi Murata, Paper Rad, Gretchen Skogerson, Antoine Catala, and Brody Condon. The exhibition was conceived with a very specific group of artists in mind -- artists who placed both the dysfunction and arrogance of ever-changing technologies at the center of their work. In a sense, these artists are working in the shadow of a technological dystopia (and euphoria) that had begun as early as the Industrial Revolution -- as expressed in the vacant, vectored glances mapped out in Edouard Manet's The Balcony (1868-69) or the absolute pleasure of stop-motion animation in Georges Melies' An Up-To-Date Conjuror (1899). 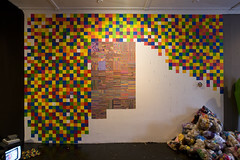 Melissa Ragona: Last night I was asking about how you each manipulate your work at the level of the pixel. But, in a larger sense, I want to know where your work is going in terms of its relationship to technology -- especially because "PREDRIVE" is about what I am calling, the anti-wow effect of new technologies -- the disappointment of new technologies' promise to bring us somewhere else faster or to offer a yet-to-be imagined visual/audio space. I first became interested in so-called "new media," through structuralist film, focusing on filmmakers like Hollis Frampton, Paul Sharits, Tony Conrad, Joyce Wieland, Michael Snow, Peter Kubelka, et al. 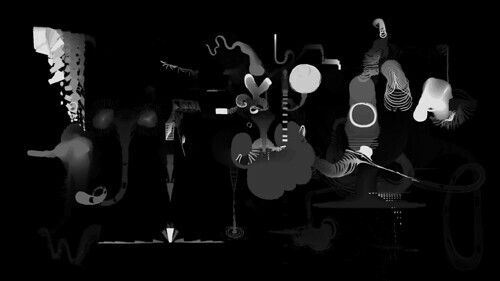 And then began exploring, a second generation of filmmakers who were also interested in film as epistemology (studied at the levels of the frame, or projection systems, or editing) primarily through the Six Pack group in Vienna which included filmmakers like Martin Arnold, Brigitta Burger-Utzer, Alexander Horwath, Lisl Ponger and Peter Tscherkassky. And, then most recently, artists involved in information visualization projects like Martin Wattenberg, Lisa Jevbratt, Ben Fry or Golan Levin. So, while I am still interested in work that is rigorously formal and reflexive about the use of technology - I am less impressed by what it produces visually. So, I know that in your [addressing Takeshi] most recent work you seem to be experimenting with freer, more improvisational forms. Or it seems that the focus is more on the relationship between frames rather than at the level of the pixel [as in Monster Movie or Escape Spirit VideoSlime]. Takeshi Murata: Yeah, but for me it has more to do with working within a different historical context. In the work I was doing earlier [as in Monster Movie] -- it's a great open territory -- working with new tools like computers or software programs. The technology is moving so quickly that there's much less of a framework through which to see the work. Now that I am working with more traditional forms of animation again, I have its history to work from, for better or worse. Jacob Ciocci: So I have a question for Takeshi -- so what's an example of this newer form you were referring to, you mean like rethinking animation? And which older pieces of yours are we talking about? TM: Well, like Monster Movie. And I'm thinking mostly about the level of incorporation of the computer, or where it’s incorporated. I initially was drawn to using the computer because of the speed. When I started to work with hand-drawn animation again, one of the main issues that was really important to me was the length of time it took to make work. If you can make something really quickly, it can change everything. I learned by doing traditional animation -- you know, you would write out script, storyboard, keyframing, you know all the classic stuff. But, in the end, like 90% of it is simply pounding it out.